Calamity Jane's Cottage: Sneak Peek of Giveaway!!! Looks like a whole lot of adorable going on there! What a lovely collection of fabrics. 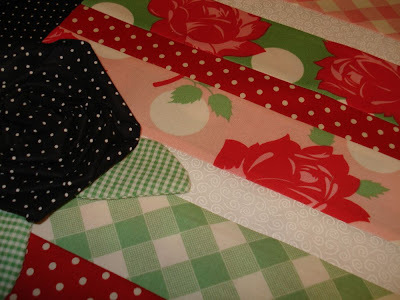 Any quilt with Swell or Sweet fabric in it is beautiful! Your project looks great to me! I forgot to leave my email....and I'm Pat not Craig. mmm... that looks like something really nice! love the flowers!Looks very springy and fills the heart with joy! Have fun! Can't wait to enter, love the colors! waiting to see what it is! Love the project whatever it is!...some of my favorite fabric. ps. you're such a tease! Pretty bright colors. Maybe a table runner? Pretty fabrics - how fun! An apron maybe? Love the colors. Would go great with the new red paint in my kitchen! It looks delightful!! Love the colors!! Did I hear you say Spring was in the air???? Hmmm...looks sweet...or maybe swell?! Cute as can be! Really like the bright and bold colours you are using, whatever it becomes! I love those fabrics! How fun it would be to win! Those are pretty fabrics so I'm sure it's going to be awesome!